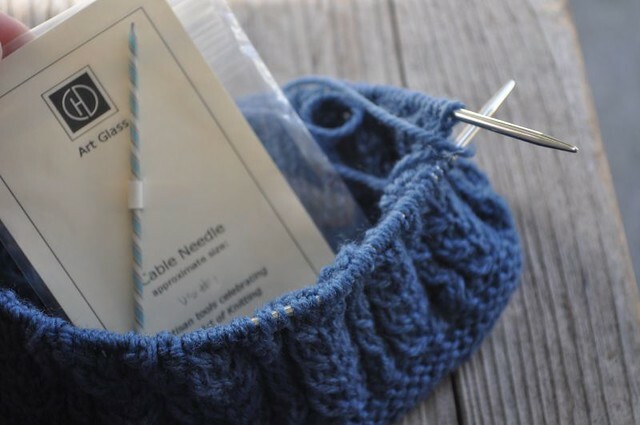 Rose-Kim Knits: Ennui? Startitis? Other Diagnosis? With Audrey out of the way I started to tackle my green-garter-stitch-making-up-a-pattern-as-I-go-along sweater. I'm starting to be vividly reminded why I buy and use patterns. 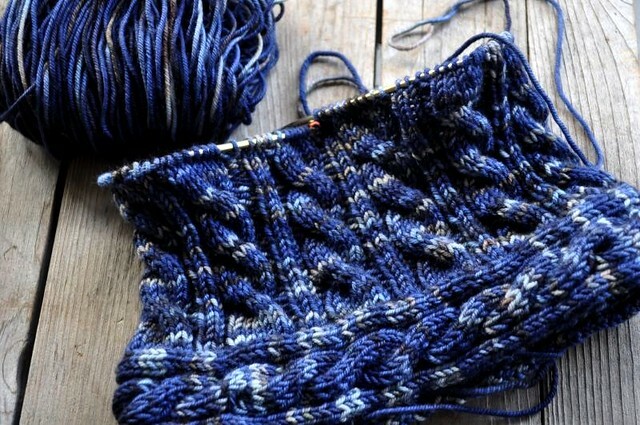 While I'm sure when I get to the end of it there will be a wearable sweater I'm already not liking a lot about it. I should probably rip it out and start again but there's some stupid, stubborn part of me that thinks, "I've put a lot of time and work into this and I'm going to stick it out even if it kills me." So I've set it aside. Yet again. My cabled beret is slow going but quite pretty. I noticed after knitting on it for an hour or so yesterday that my right thumb was very sore. I suspect cabling without a cable needle is putting a lot of stress on my finger as I push and pull the stitches. I finally have an excuse to use the beautiful, handmade glass cable needle I bought at Knitting Camp! Caitlin Hyde makes stunning glass pieces. I'm a bit afraid that I'll break this poor little guy but there's no point in "saving" it by not using it. I'm also making Clamber. I've had this one in my queue since it's release in '08. 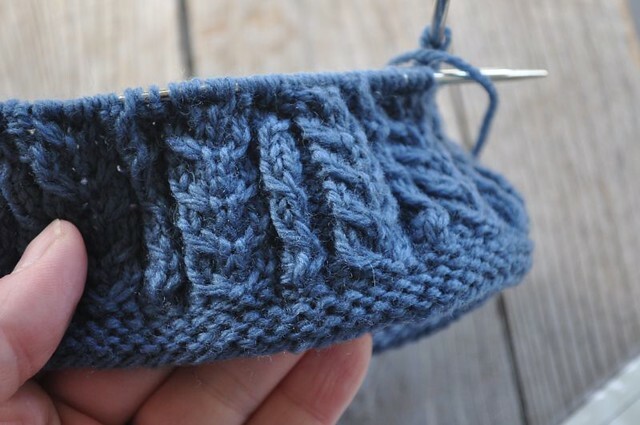 It moves quickly and it's using a partial skein of BMFA Socks That Rock Medium-weight that I used for a Syncopated Cap two years ago. I love using leftovers. LOVE IT! It satisfies something deep inside me. And yet with all this going on I still have been thinking about casting on new projects. In fact I bought yarn and beads to start Caleano from Rosemary Hill's 7 Small Shawls to Knit. Schaefer Anne in Spruce. Don't you just love it? But then why did I also pull out some Cherry Tree Hill Supersock and wind it to start the 22 Leaves Shawlette Mystery KAL? I don't even like mystery knitalongs. But maybe my love of leaves and lace is winning out? 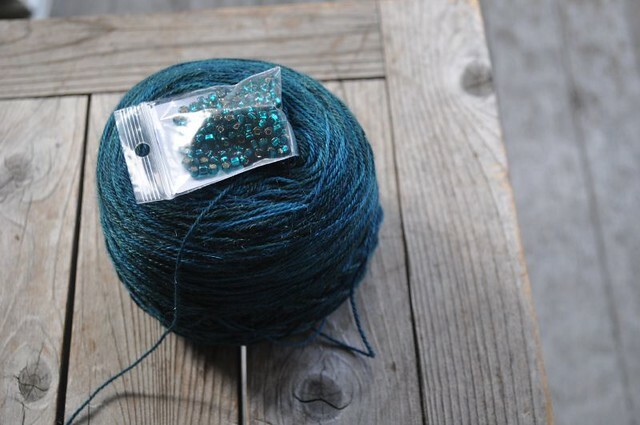 Or I'm happy to find a shawlette that takes less than 400 yards of sock-weight yarn? Not that I like shawls that small. 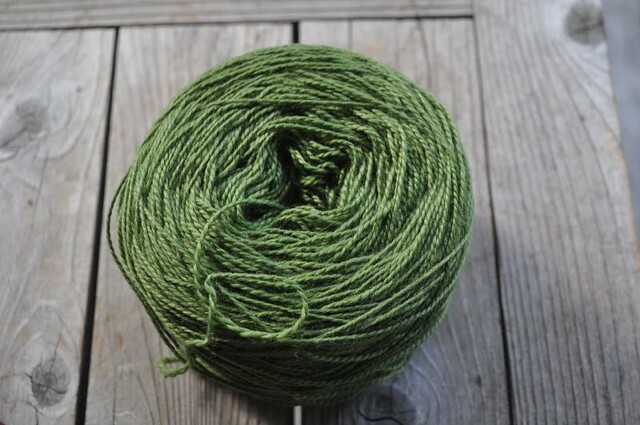 But this yarn was kind of born to be a leaf lace pattern. Katarina only needs another inch of garter stitch on the collar. I should probably be doing that right now instead of typing this post. Nothing's wrong with you, says the woman with, oh let's see, six projects on the go. Thanks a bunch for the lead on the 22 leaves mystery KAL... I just casted on! I have never done a mystery KAL, but hopefully this will work out well. Yes, I think I'm about to pull out that green skein of Smooshy myself ~ and I already have two shawls and a sweater in the works!